About the Sport . . .
Fencing is the fastest combat sport there is. It combines speed, agility, reflexes, stamina, and strategy. Despite this, it doesn't take long to get to a level where you can enjoy fencing others at your own level, and from there, improvement is made at whatever speed your coaching and practice will allow. Whether fencing is considered to be an art of enjoyment or a science of weapons, a method of education or a sport, its study reveals a thousand-year-old history, a wide range of technical skills, a laudatory record of achievements, and above all, the values created by fencing that are still taught today through the practice of this sport. The modern Olympic sport requires fencers to be of the fittest of athletes and have levels of skills which require many hours of dedicated training. 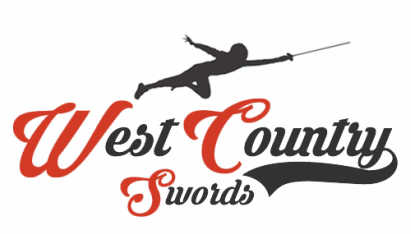 In learning the skills of attacking and defending with the Foil, Epee or Sabre swords fencers develop good co-ordination, balance and flexibility which makes fencing training an ideal means of keeping fit for all ages and abilities. When fencing is offered as a holiday activity or at a taster session there are always large numbers of youngsters who wish to emulate their story book heroes. Fencing for those in wheelchairs is a major sport in disabled competitions and Britain has won many medals at fencing in the Paraplegic Games. Certain disabilities prove to be of little disadvantage at fencing and those who are unable to compete in other sports find that they can compete on equal terms with able-bodies fencers. Fencing takes place on a 14 metre long by 1.5 - 2 metre wide piste. Hits are judged by the electric scoring equipment but the referee makes the decisions on who, if either, scores. The sport is extremely fast and making those decisions can be very difficult. To aid the referee, video replays have just been introduced at major events, such as World Championships and the Olympics. Bouts are first to 5 hits in the early part of individual competitions and to 15 hits in the later knockout stages. Team matches are now normally run on a relay system with each bout picking up the score where the last on left off. For teams of 3 the winner is the first team to reach 45 hits. Does it hurt and is it dangerous? How fit do you have to be to start? ​Does it hurt and is it dangerous? No. When performed correctly a hit in fencing does not hurt at all. Fencing is also not dangerous, it records proportionally far fewer injuries than sports such as football and tennis. Special clothing and masks ensure that you are completely safe. You don’t need to be particularly fit to start fencing – your fitness level will improve with your training. The majority of the training is done at your own speed allowing you to push yourself as much as you like. You do however need to inform us if you have any medical conditions that may effect you during training. ​You’re never too old to start fencing, people regularly continue to practice the sport well into their 70’s and even 80’s. We don’t take children below the age of 7 due to safety considerations and children below the age of 7 usually use plastic training weapons. Fencing is, however, the ideal sport for children – developing their co-ordination, balance and fitness whilst building social skills and confidence. The first thing you should get is a pair of breeches (fencing trousers) as these are required for all electric fencing. Next your own electric sword and bodywire are essential purchases.